Series? Yes. 1 of 6. I had serious doubts about this book initially as it was marketed as ‘Game of Thrones for teens’, which raises the bar ridiculously high. However, I had a lot of fun with it and think it’s a great first taste for those struggling to get into high fantasy. Even in the darkest and most cruel person, there is still a kernel of good. and within the most perfect champion, there is also darkness. Like Game of Thrones, this series includes multiple POV from 5 different characters. I always love when the author decides to do this, as I love getting into the heads of different characters. When you can see things from someone’s POV, it’s hard to think of them as a villain – it’s also hard to think of anyone as pure and good. For me, morally gray protagonist is where the magic happens – it’s damn hard to relate to a squeaky clean saviour, just as it’s damn hard to sympathise with a moustache twirling villain. Cleo is arguably the main character of the story: she had the most page time and meaningful interactions with two other POV characters. It took me a while to warm up to her, she was weak, spoiled, with a tendency to make the worst life choices. However, she underwent a lot of growth and I can already tell she will only improve from here on out. Magnus is the standard angsty prince with daddy issues, but I do enjoy the dark direction the book seems to intend for him. Jonas is filled with hate and on a quest for vengeance, he will inevitably rise above his personal pains for the greater good of his people – but I found him interesting despite his predictable storyline. Lucia is the weakest link at the moment, she is largely clueless but has the potential to be the most powerful, I hope she gets more development in the next book. Finally, Ioannes only had three chapters this book, but I am very intrigued by his world (he’s like Dany, removed from the main action but most in touch with the fantasy element of the plot) – I hope to see more of him. Personally, an essential element of any high fantasy is a well realised world with large scale and potential for conflict. We have that in the spades here with the three kingdoms of Mytica. There’s beautiful, lush Auranos to the south flowing with wealth and joy. On the other side of the spectrum lies the cold, frigid land of Limeros – whose citizens are devout in their worship of a lost goddess. 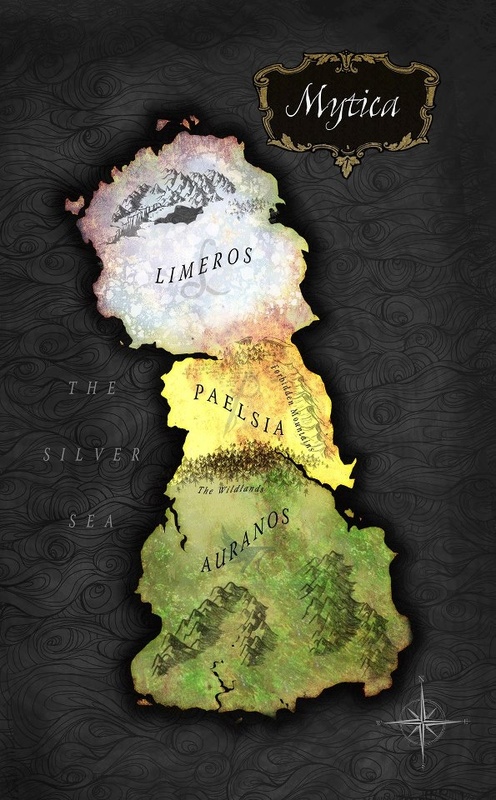 In the middle lies the poor, barren land of Paelsia, a land that despite all odds have enough magic to support the world’s best vineyards and a budding revolutionary. The events in Falling Kingdoms throw these nations at one another to directly confront centuries of bubbling anger and resentment. There’s also a hint of a more developed magic system, another crucial aspect of fantasy. I love the mythology behind the two goddesses: Cleiona and Valoria. I’m also intrigued by the lost magic of the land and the roles the Watchers have to play in future installments. Though this aspect of the book was not fleshed out, I’m happy knowing there’s five more volumes to develop it. Love is stronger than anger. Love is stronger than hate – stronger than anything. I really enjoyed reading the interactions between all the different characters and the underlying current of either mistrust or love between them. I’m especially to see how the interactions between Cleo-Jonas and Cleo-Magnus will evolve, as they seem bitter enemies at the moment, but I can see those relationships doing a 180 quickly and believably. This fluidity to the character relationship is something that I can totally get behind and support. I am also excited to see how Lucia will interact with the other characters, as she’s largely limited to Magnus at the moment. Mild spoilers though: there’s fauxcest here. Which, while something I am more than accustomed to seeing in South Korean dramas, was quite creepy here. Thankfully, the author seems to agree (I think? I haven’t read the sequel at this stage). Nonetheless, it at least makes ground for interesting character relationships. 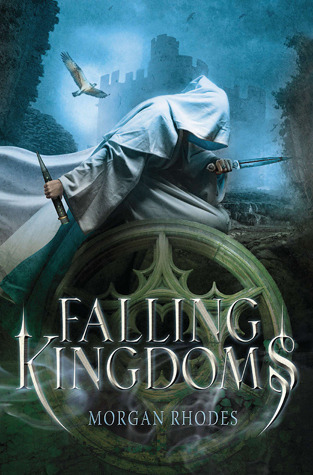 I do think that Falling Kingdoms is a great fantasy series to cut your teeth on if you are turned off by the door-stoppers, multi-volume saga in pre-existing adult series. I would hesitate to call it a ‘lighter fare’ or ‘for teens only’, as that’s beyond condescending and untrue – but I do think that the writing and plot is a lot more accessible for a younger audience. I had so much fun with it, and will definitely be reading the sequels before the release of Frozen Tides. ‹ PreviousDiscussion: Do You Feel Pressured to Read Hyped Books? Great review! I’ve been meaning to start this series for quite a while, but just haven’t gotten around to it. Massive adult fantasy tomes don’t do it for me, so I’m a big fan of more manageable novels. 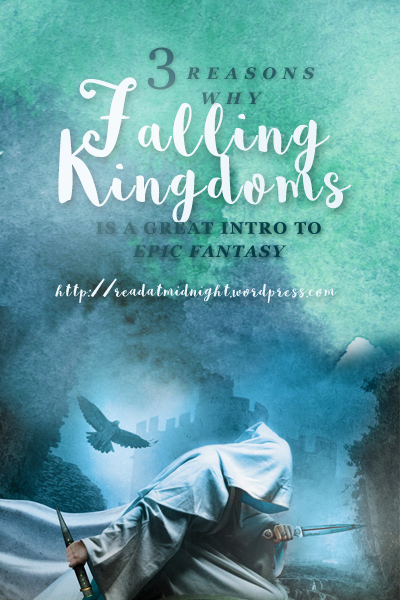 I would highly recommend Falling Kingdoms and Snow like Ashes if you want a taste of fantasy but don’t want to commit to those giant volumes – they scare me a bit, too! Haha. Such a great and detailed review! I’ve been wanting to get into this for the longest time, but the comparisons to Game of Thrones intimidate me, haha! I agree- the complexities and layers a character obtains because of multiple POVs is always a delight! Thank you 🙂 I hope you will enjoy it when you get a chance to read it, would love to discuss it with you! I know I was shocked too when I found out! They have a spin off series set to be released soon as well haha. Yes it’s exciting to see epic fantasy in YA, I hope there will be more like it! I need to read the sequels now though. Thank you Melanie 😀 I love it as it had so much potential for more, hope you will get a chance to read it — though I know your plate is full now with the 20 books from inkyreads judging haha. It will finish in another 2 years so I hope you can give it a go then Camyll! I understand your reservations, I am the literal worst at finishing series if I have to wait for a year between books haha. I pushed it up my TBR thanks to your review! Thank you so much for writing it 🙂 I’m excited to check out the rest of the series. I'm very excited for you! Oh wow! Now I really have no excuse to not read these. Great review! Really makes me want to pick them up right now and start reading them! Ahhh I love your blog aentee, it’s so pretty! This book actually sounds pretty perfect for me actually, I love my fantasies and never wanted to read Game of Thrones but I love how complex the world and all of the characters sound. Adding this to my TBR! Yes I think this is a perfect if you are in the mood for high fantasy, the characters have potential– some of them weren’t fully developed this book though. Hope you enjoy it when you get a chance to check it out! Lovely review! I liked this one — but I think I expected a little too much from it, you know? I mean, when you are comparing something to Game of Thrones… Well. That sets the expectations high. For the most part though, this was very enjoyable and well-written I thought. I’m actually close to starting the third book! Yeah the GOT comparison really hurts it, but I agree that it was entertaining. I still have to finish the other two books released as well. Haha. *gasp* blasphemy! Kidding haha, what didn’t you like about it? I hope you enjoy this book though. I literally squealed when I saw this post on my reader. I’m so happy you read and enjoyed it! I really want to read this series but I am scared it will be too ‘light’ compared to ASOIAF which is my all time favourite series. I think the best thing is just to read it with an open mind and expect nothing like GoT, that way you won’t be disappointed haha. Great review! I can’t wait to begin reading this series 🙂 I think a lot of titles were compared to ASOIAF but each story is a gem on its own. I love high fantasy and I’m intrigued by the world building in this book. I skimmed your descriptions of the characters and their relationships with each other because I don’t want to form a bias before I read it myself, hehe. Ah I really hope you enjoy it 😀 it’s a lot less tense than many other high fantasy, but still an engaging plot! Can’t wait to hear what you think. I’m the same, I often skin read the important sections of reviews in books I haven’t read haha. Awesome! I have never really been sure about reading this series, just because it’s never been on my radar, but I’m glad that it seems more readable than Game of Thrones! (That series just intimidates me hahah) Nice review! I love ASOIAF but if you’re not ready to commit to those door stoppers, this is a good start to epic fantasy. Hope you enjoy! Yep, I agree that it’s definitely hard to relate to moustache twirling villains and squeaky clean saviors. Gotta have that gray area. Morally ambiguous protagonists are the best! !